Mix apple slices, sugar, 1/2 cup flour and 1 tsp cinnamon for the filling. Set aside. Mix ingredients for pie crust. Divide dough in two pieces, wrap with plastic wrap and let rest in the refrigerator for 30 minutes. Flour your surface area. Roll out 1/2 of the dough to fit a 9×13 pan with sides. Cover with apple mixture. Roll out top crust. Cover with top crust. Brush top with egg white. Bake at 350 for about 60 minutes. Mix 1 cup powdered sugar and 1/2 tsp vanilla with enough cream or milk to make thin frosting. Mix well and spread over hot crust. 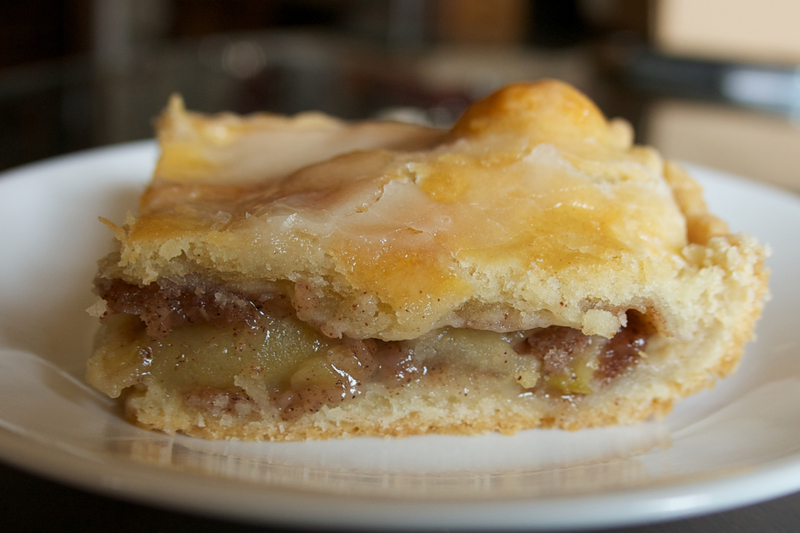 This entry was posted in Uncategorized and tagged apple bars, apple pie, apple strudel, bars. Bookmark the permalink.